Farms across Indiana are busy making their final preparations for the upcoming yearling sales. Some farms have even taken theirs the extra step and have them broke and jogging, which is always a plus for the consumers. A lot of work goes on behind the scenes to get all the avenues covered to sell a yearling, and Mark Bontrager of Fort Wayne, Ind. is part of that process. 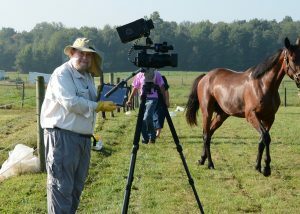 A graduate of Manchester College, Bontrager makes his way around to numerous Standardbred farms and videos the yearlings to produce videos for the sellers. The videos are then downloaded and can be viewed both online and at the upcoming Hoosier Classic Yearling Sale, set for Friday, October 19 and Saturday, October 20. ISA Director Dr. Alan White was recently in attendance for one of the yearling sessions at In Law Stables near Topeka. “Mark’s work is the heart of the Hoosier Classic Yearling Sale for both buyers and sellers,” added White. Several of the videos are already attached to the Hoosier Classic Yearling Sale page. To view videos of yearlings headed to the sale, go to the sale company website at: http://hoosierclassicyearlingsale.com/entries.asp.